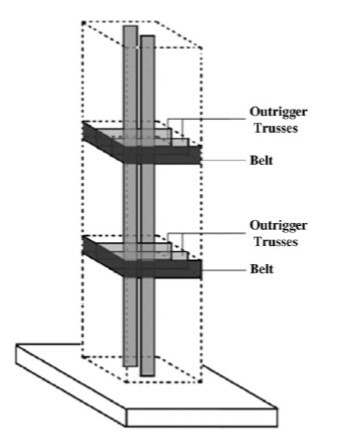 The outrigger and belt truss system is one of the lateral loads resisting system in which the external columns are tied to the central core wall with very stiff outriggers and belt truss at one or more levels. 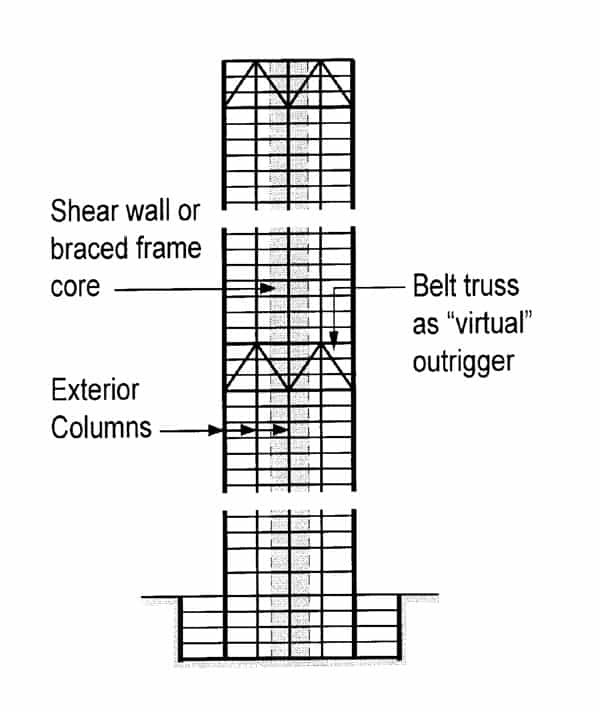 The belt truss tied the peripheral column of building while the outriggers engage them with main or central shear wall. 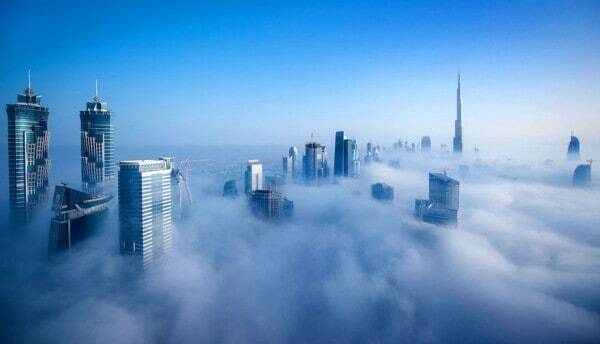 The aim of this method is to reduce obstructed space compared to the conventional method. The floor space is usually free of columns and is between the core and the external columns, thus increasing the functional efficiency of the building. 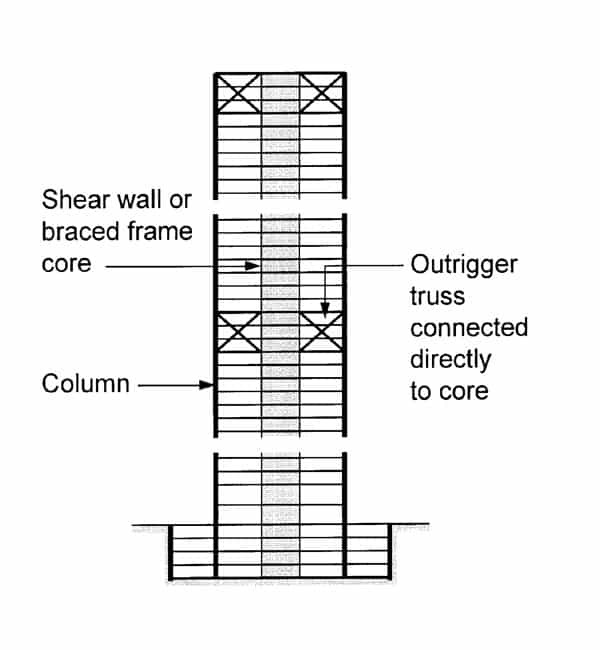 Exterior columns restrained the core wall from free rotation through outrigger arms. Outrigger and belt trusses, connect planar vertical trusses and exterior frame columns. Outrigger system can lead to very efficient use of structural materials by mobilizing the axial strength and stiffness of exterior columns. The great sailing ships of the past and present use outriggers to help resist the wind forces in their sails. 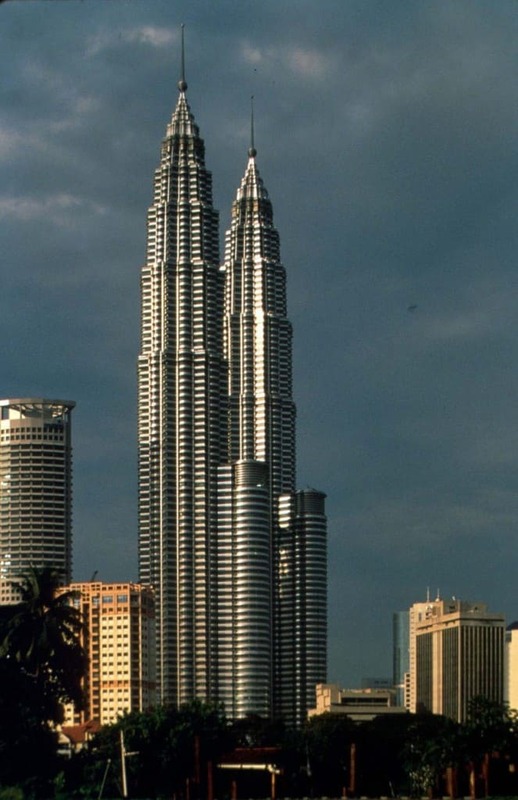 Like the ship, the core in the tall building can be related to the mast of the ship, the outrigger acting like the spreaders and the exterior columns like the stays or shroud of the ship. The incorporation of an outrigger which connects the two elements together provides a stiffer component which act together to resist the overturning forces. 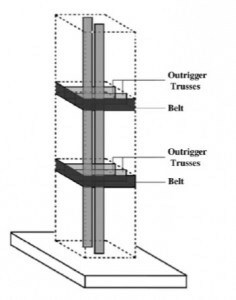 When an outrigger-braced building deflects under wind or seismic load, the outrigger which connects to the core wall and the exterior columns, makes the whole system to act as a unit in resisting the lateral load. In the conventional outrigger concept, the outrigger trusses or girders are connected directly to shear walls or braced frames at the core and to columns located outboard of the core. Typically (but not necessarily), the columns are at the outer edges of the building. In the “virtual” outrigger, the same transfer of overturning from the core to elements outboard of the core is achieved, but without a direct connection between the outrigger trusses and the core. The basic idea behind the virtual outrigger concept is to use floor diaphragms, which are typically very stiff and strong in their own plane. The use of belt trusses as virtual outriggers avoids many of the problems associated with the use of conventional outriggers. The principle is the same as when belt trusses are used as virtual outriggers. Some fraction of the moment in the core is converted into a horizontal couple in the floors at the top and the bottom of the basement. 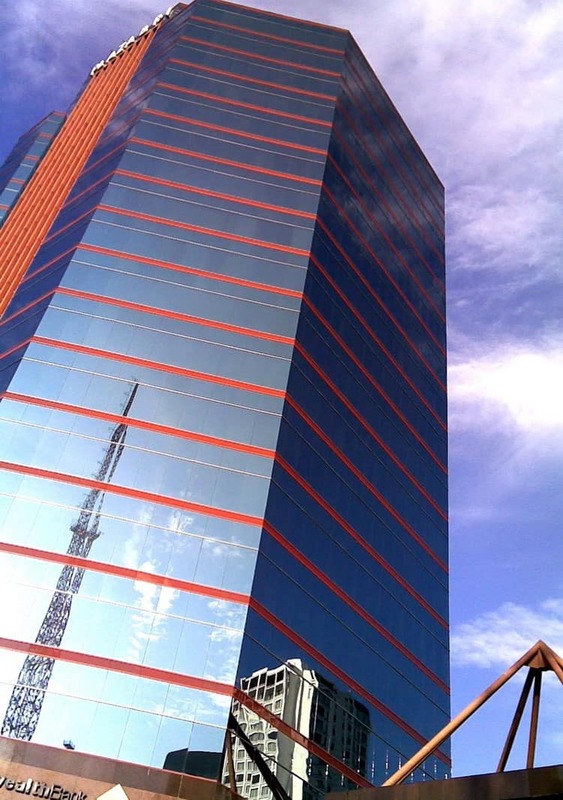 1.There are no truss diagonals extending from the core to the exterior of the building. 2.The need to locate outrigger columns where they can be conveniently engaged by trusses extending from the core is eliminated. 4. Differential shortening or settlement between the core and the outboard columns does not affect the virtual outrigger system since the floor diaphragms, though stiff in their own plane, are very flexible in the vertical, out-of-plane direction. 1.The stiffness and location of the outrigger truss system. 2.The stiffness and location of the Belt truss system. 3. Geometry of the tall building. 4. Stiffness of the central core. 5. 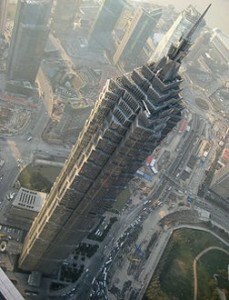 Floor-to-floor height of the tall building. 1.There are no trusses in the space between the core and the building exterior. 2. There are fewer constraints on the location of exterior columns. 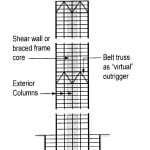 The need to locate large exterior columns where they can be directly engaged by outrigger trusses extending from the core is eliminated. 3. All exterior columns (not just certain designated outrigger columns) participate in resisting overturning moment. 4.The difficult connection of the outrigger trusses to the core is eliminated. 5. Core overturning moments can be reduced through the reverse moment applied to the core at each outrigger connection. 6. Exterior framing can consist of simple beam and column framing without the need for rigid-frame-type connection, thus reducing the overall cost. 7. Reduction or elimination of uplift and net tension forces without the column and foundation system. 4. The difficult connection of the outrigger trusses to the core is eliminated. 5. 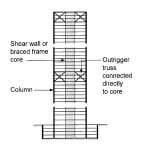 Complications caused by differential shortening of the core and the outrigger columns are avoided.